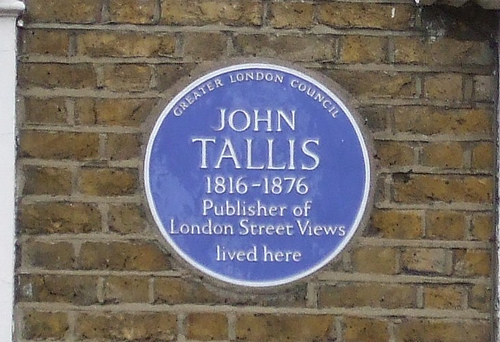 According to the advertisement Henry Churton had in several of Tallis’s Street View booklets, he had taken over from the late E. Churton who had established the shop in 1781. E. Churton was Henry’s father who does indeed feature in early directories, for instance in Lowndes’s London Directory of 1786. The premises at 140 Oxford Street were situated on the corner of Old Cavendish Street and “nearly opposite New Bond Street” as Churton said in his advertisements. That is stretching it a little bit, but Churton no doubt thought that New Bond Street was a better reference for his shop than Old Cavendish Street. The corner property, and in fact, the whole block, is now occupied by John Lewis. The map from the Street View booklet is orientated south-north, so upside down from the usual orientation we nowadays use. New Bond Street seems to run north on the map, but it does in fact run southwards. The building, and many of the surrounding ones, belonged to the Duke of Portland who took out an insurance in 1814 and in 1817 for his Oxford Street properties. The Sun Fire Office entry lists Edward Churton as the tenant of number 140. 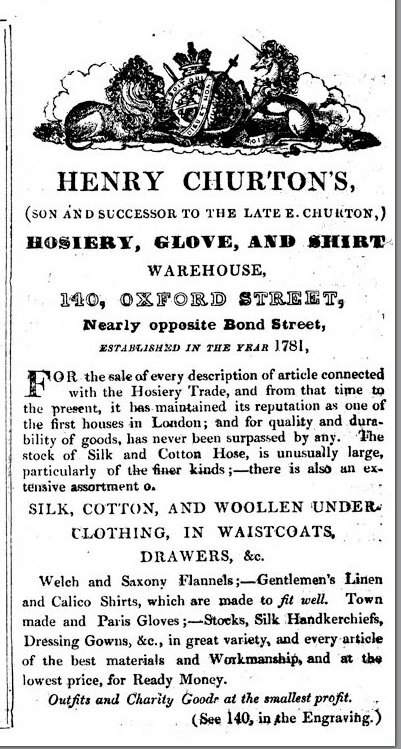 So, Henry took on the hosier’s shop of his father and he received a favourable mention in 1839 for the elastic rollers for horses’ legs in The Era of 27 October. The newspaper report tell the story of a horse after a long hunt which not only had to contend with the cross-country chase and the fences that need to be jumped, but also with the ride home which may be many miles. After such exertion, the legs of the animal need to be washed with warm water, rubbed and kept warm. This is normally done with flannel bandages, which, although it keeps the legs warm, are inflexible and will either be wound too tight and then hampering blood flow or too loose and then likely to slip down. But, Churton’s Cotton Webb is elastic and hence far superior to the old-fashioned flannel. Despite this apparent success and the insertion of several advertisements in the Tallis booklets, a year later, bachelor Henry leaves England for New Zealand, so only just after Tallis listed him in his Street View of Oxford Street. 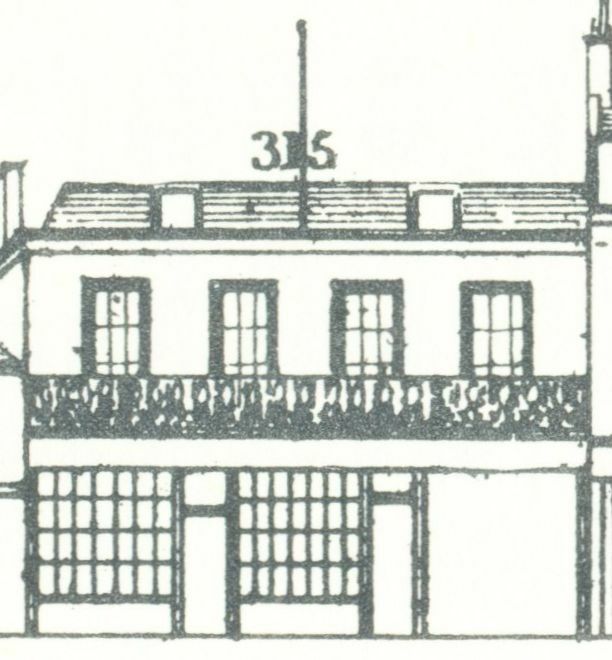 The hosiery shop was listed for one Gilbert Wilson in the 1843 Post Office Directory. Churton travelled on the ship ‘London’ which sailed on 13 August 1840 and arrived four months later in Wellington on 12 December (see here). Henry was a cabin passenger, so certainly not fleeing from financial troubles and later reports of him suggest that he was rather well off. Why he went to New Zealand is unclear; he may have been drawn to the adventure or just sick and tired of hosiery. Henry settled in Wanganui on the North Island, which had only recently been reached by Europeans. The first traders only arrived at the mouth of the Wanganui river in 1831. According to David Young in his Woven by Water: Histories from the Wanganui River (1998), Churton ran a public house, which was presumably more profitable than selling hosiery to the early settlers. 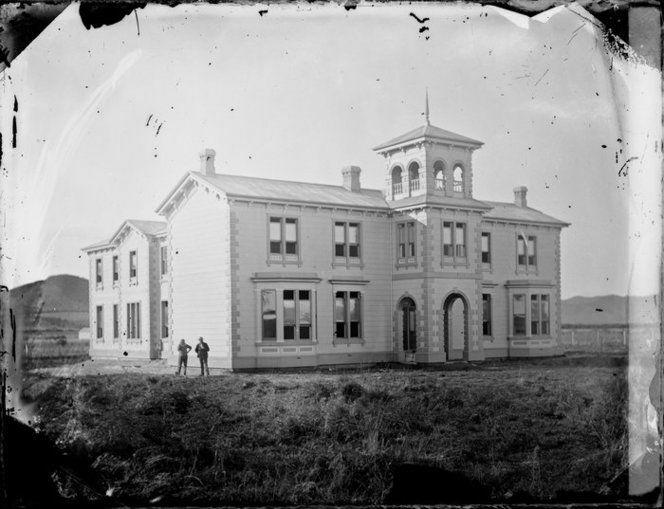 Henry seemed to have had a good relationship with the indigenous population and in 1880, he built a school/college/home for Maori girls. Read more about the building here or even more about it in the newspaper articles listed here. In 1845, some letters written by Churton in 1844 were published by his brother Edward, who had his business in Holles Street. The whole book can be read online here. 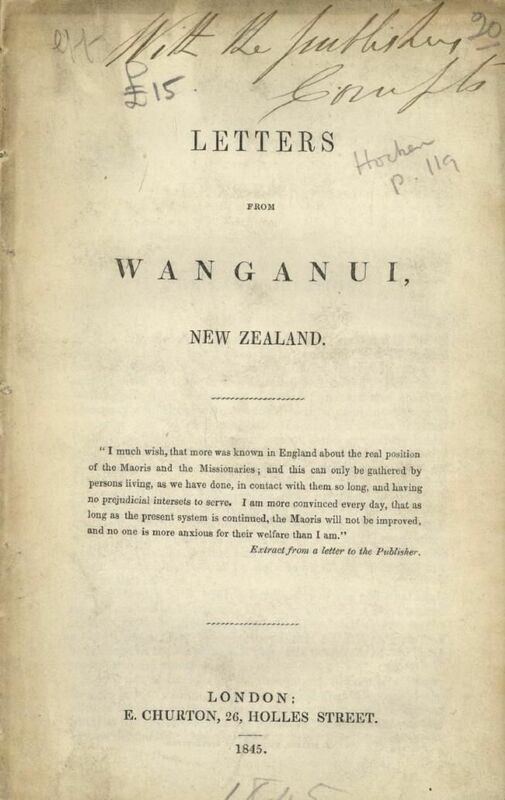 The title-page contained a paragraph by Henry on his thoughts about the treatment of the Maoris. (1) PROB 11/1833/396. One of the executors is “my brother William Churton” who may be the hosier of 91 Oxford Street. 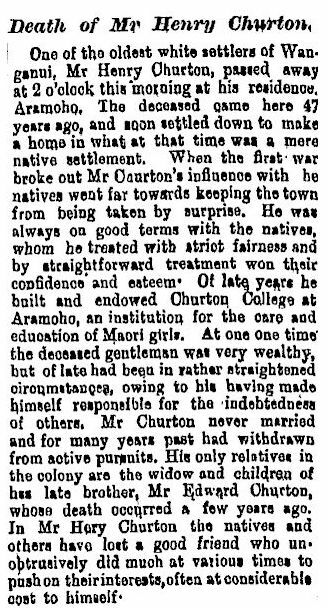 (2) Wanganui Herald, 27 July 1885. (3) Wanganui Herald, 1 September 1887. Charles Danieli originally came from Italy, but he was certainly in London by December 1819 when his two children Charles junior and Sophia were baptised at St. Marylebone’s. Charles senior and his wife, also Sophia, were to have several more children and the census of 1841 lists Sophia (22 years old), James (20), Frederick (15), William (15), Alfred (7), Cecilia (5) and Rosina (3). Charles junior, who is calling himself Charles George, or Carlo Georgio to emphasise his Italian roots, described himself as a jeweller and lived at 13 Little Titchfield Street with his wife Charlotte Emma Annis. At the same address (all properties in that stretch of Little Tichfield Street housed more than one family) lived Elizabeth Annis (65 years old), Mary Annis (35) and John Annis, plumber (30). They were undoubtedly Charlotte Emma’s mother and siblings as the will of her father John (he died in 1839) names his wife Elizabeth and his son John William, plumber, and gives the address of 13 Little Titchfield Street. Charles Danieli (whether it was senior or junior is not specified) was one of the people asked to confirm that the will was written in Annis’s handwriting. Carlo Giorgio Danieli, restorer of old paintings after the Italian method, begs to inform those who possess pictures that have suffered by time or otherwise, that his mode of restoring is entirely different to that in general use in England, and far excels it both by reinstating the picture in its original state, and securing it entirely from injury during the process. C.G.D. being likewise an Artist understands more perfectly the composition of a picture, and in consequence the exact application of the process of restoring it; which he undertakes to perform in a superior manner, let the glazings and finish be ever so delicate. – At the same time it will be found worthy of notice that the terms are much below the usual charges for restoring in the ordinary way. This leaflet, dated May 1846, has the hand-written address 50 Upper John Street, Fitzroy Square on it, while another copy, with the same text, but undated, gives 81, Newman Street, Oxford Street. Charles George alleged that he had had 10 years of experience as an artist, especially as a copyist of Italian Old Masters and that he is capable of restoring and aging missing bits of paintings in such a way that no difference can be seen with the original. I don’t know what the good people of the BBC’s Fake or Fortune programme would think of this practise, but in the 1840s, it was quite an acceptable thing to do. Brother James at number 304 had died on 27 March, 1847, just 33 years old, but his widow Sophia continued the shop and an advertisement she put in the Catholic Directory shows us what kind of shop it was. I particularly like the combination of ornamental hair-work and engraving. Not quite what you would nowadays find in the same shop as watches and cutlery. Did James take over the business of Thresher who was mentioned by Tallis? And do the engravings the widow mentions in her advertisement have anything to do with Willey, the print seller? I will try and find out and let you know in the (future) posts on these two gentlemen. (1) Old Bailey case t18241028-130. (2) Old Bailey case t18330214-236. (3) Old Bailey case t18351214-200. (4) Old Bailey case t18390916-2496. (5) Old Bailey cases t18410705-1851 and t18410301-900. (6) The London Gazette, 17 December 1841. (7) The London Gazette, 25 March 1842. (8) The London Gazette, 31 March 1843. (9) C.A. 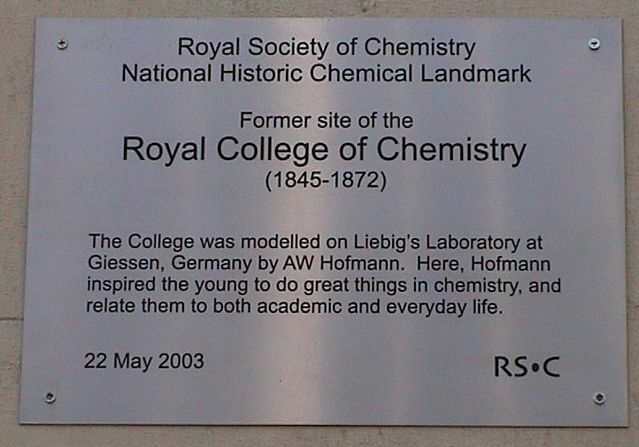 Russell, Edward Frankland: Chemistry, Controversy and Conspiracy in Victorian England (2003), p. 303 (online here). (10) Westminster Archives, access number 1396/6. (11) England & Wales, National Probate Calendar (Index of Wills and Administrations), 1866. His estate is valued at under £200. 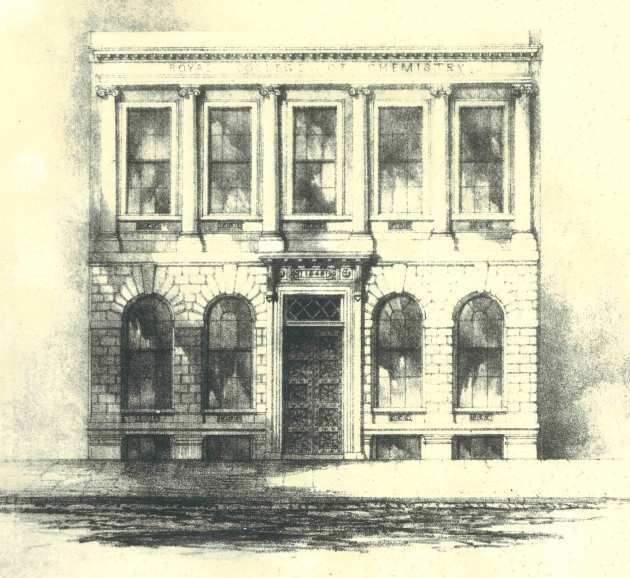 The shop of Samuel Mart at 130 Oxford Street was a substantial building on the corner of Holles Street. 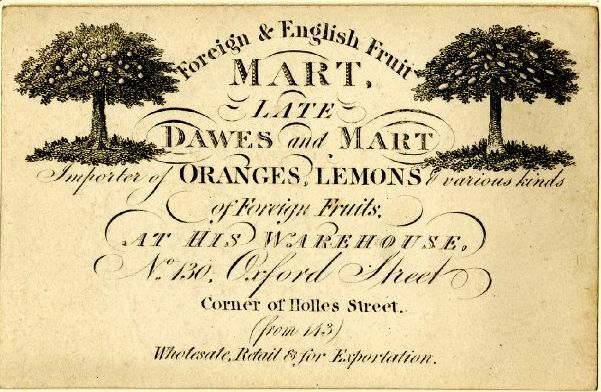 The earliest evidence for the occupation of that shop by the fruiterer is a 1823 list of members of the Horticultural Society, although that was not the Samuel Mart of the Tallis Street View, but his father, also called Samuel. The fruiterer had been in Oxford Street before that, but, as many records do not mention an actual house number, I do not know for certain when he started trading at number 130. 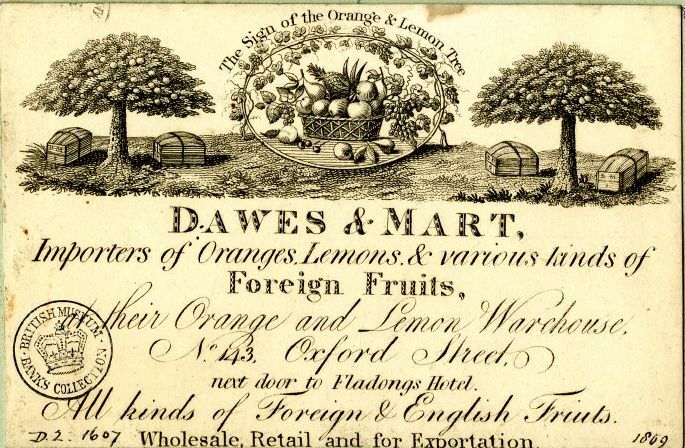 At some point (at least as early as 1808, but perhaps even earlier), Samuel senior had been in partnership with another fruiterer, John Dawes at 143 Oxford Street and in 1802 that number is given at the baptism of one of the Mart children. The move from number 143 to 130 probably took place in or just before 1823. Samuel Mart did a lot better at number 130 than his former partner had done and even received the patronage of the Royal household. 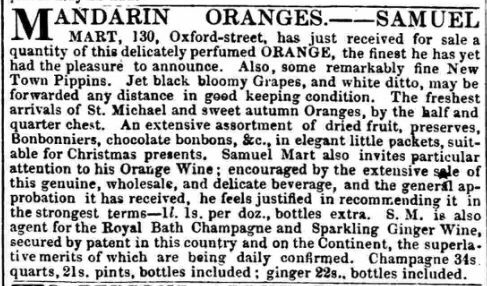 In 1844, Mart junior advertised in The Morning Post of 15 November with a fresh supply of New Town Pippins, “superior in flavour to any that have been landed for some years”. They were possibly very good in 1844, but the batch he sold in 1846 was not received as well as he might have hoped. The Hutchinsons, a family of singers from America, were on tour in England in 1846 and on 5 February “on the corner of Hollias and Oxford Streets entered a fruit shop for apples, for small Newtown pipins 3d each (5 cents). Outrageous price! Bought 3 English apples each about the size of a walnut for 3 pennies”. (2) It cannot have been as bad as Hutchinson makes out, as the Royal approval would undoubtedly not have been given to a fruiterer who consistently sold inferior produce. Samuel Mart senior had married Ann Grange on 5 January 1800 and their eldest daughter Mary was baptised on 1 December of that year at the Independent Providence Chapel at Grays Inn Lane. In 1802, when daughter Sarah was baptised at Grays Inn Lane, the address of 143 Oxford Street is given. In 1805, there was a change of chapel as daughter Ann was baptised at the Tottenham Court Chapel. Daughters Lydia (1806) and Elizabeth Margaret (1808) are also baptised there, but that chapel did not record the address of the parents. Two more children were born to Samuel and Ann: Hannah Kezia (born 1809) and Samuel junior (born 1811), but I have not found any early baptism records for them. However, in 1824, all five surviving children (Sarah and Lydia died young) were (re-)baptised on 30 December 1824 at St. Marylebone’s. 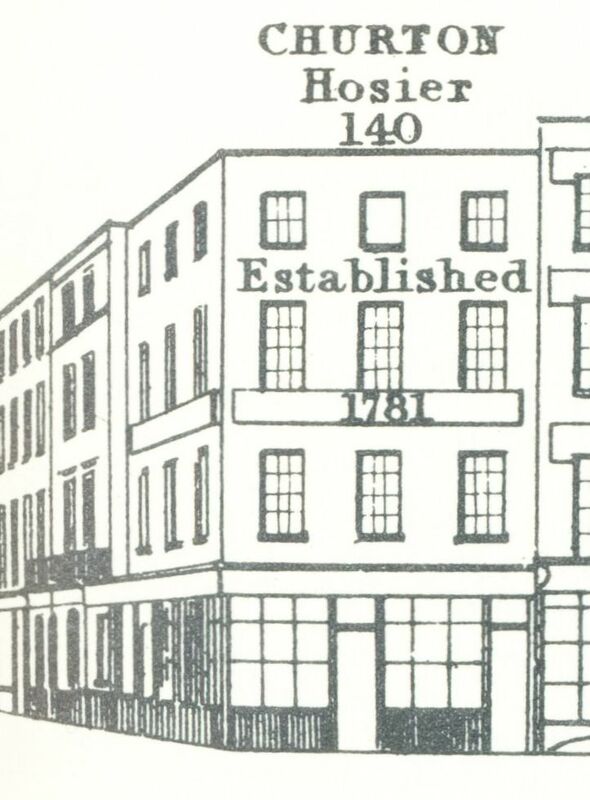 Samuel junior took over the shop after the death of his father in 1839. 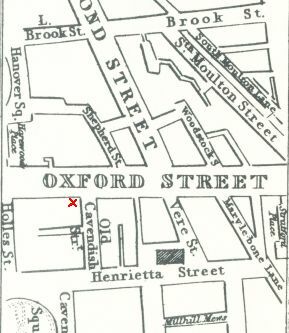 Where he is at the time of the 1841 census is unclear, as the only Mart to appear at the 130 Oxford Street address is Hannah. Besides some servants, a Margaret Dawes can also be found there and in the 1851 census, she is described as “cousin” to Samuel, who, with his wife Margaret Elizabeth, is found at number 130. Margaret Dawes is singled out in Samuel senior’s will as one “who has been many years in my employ in my business and has conducted herself to my satisfaction” and if she continued to do so, his wife is charged with giving her “a discrete bequest”. 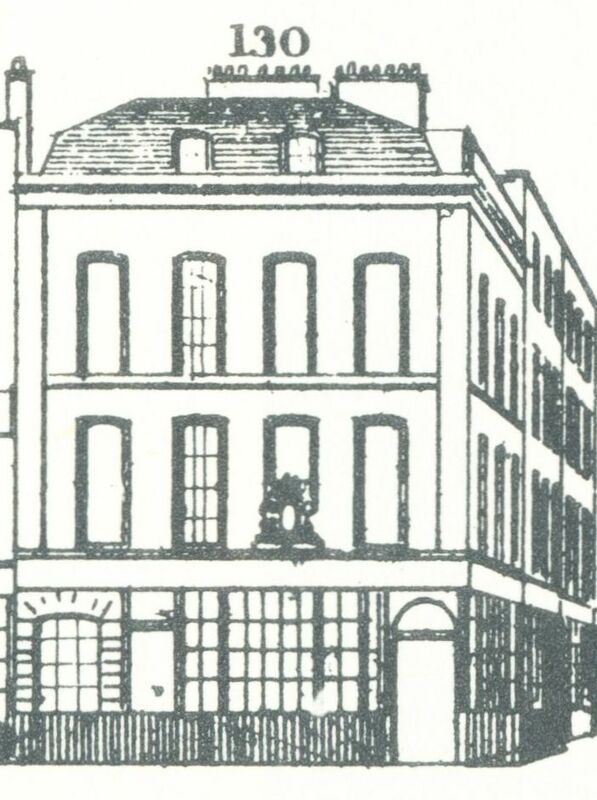 Since Margaret is still living at 130 Oxford Street in 1851, we may assume that she continued to give satisfaction. Was she, by the way, a relation of the former partner John Dawes? And if so, were the Dawes and Marts related by marriage? I have not found any evidence, but it is entirely possible. Also living at number 130 in 1851 is 16-year old nephew Caleb Porter who is later to take over the business of his grandfather and uncle. Three of Samuel Mart junior’s sisters (Hannah remained unmarried) and his own daughter married other London shopkeepers. In 1834, Elizabeth Margaret married Thomas Porter, surgical instrument maker. Their son Caleb came to work in the fruiterer’s shop and was to continue it after Samuel junior’s retirement. In 1835, Mary married John Pearson Teede, a grocer at 85 Bishopsgate Street Without. In 1836, Ann married Charles Baddeley, a boot and shoemaker at 102 Fleet Street. Charles was the son of another Charles who had his shoemaker’s shop at 130 Strand. In 1839, Samuel junior married Margaret Elizabeth Rippon. Their daughter Margaret Rippon Mart was to marry Ebenezer John Wallis, the son of Edward Wallis, a publisher at 42 Skinner Street. The family links seem to have been quite close, as they all appear as executors in wills and probate records of their relations. Samuel Mart senior had originally named “his friend” John Baddeley of 48 Oxford Street as his executor, but revokes that and names his own son Samuel and his sons-in-law John P. Teede and Charles Baddeley (the nephew of friend John Baddeley) as executors. (1) Reports of Cases Argued and Determined in the English Courts of Common Law, volume 32 (1838). (2) Excelsior: Journals of the Hutchinson Family Singers, 1842-1846 (1989), p. 339. (3) The International Exhibition of 1862. The Illustrated Catalogue of the Industrial Department, volume 1. (4) England & Wales, National Probate Calendar (Index of Wills and Administrations), 1880. Ebenezer had died 26 October 1879 at Sutton Lodge, the home of his father-in-law. His estate was valued at under £800. (5) England & Wales, National Probate Calendar (Index of Wills and Administrations), 1884. Probate granted to his widow Margaret Elizabeth. The estate vauled at over £26,374.